Growing up in Columbus in east-central Nebraska, I rarely ventured west through the Cornhusker State as a kid. However, that changed when I made the decision to attend the University of Nebraska at Kearney (UNK), a two-hour drive southwest of my hometown. Living in Kearney provided a change in scenery from Columbus, as well as an introduction to the Central Platte River Valley where UNK is located. For three and a half years, I traveled between my hometown and my college town for holidays and much needed weekend breaks from vigorous schoolwork. As an underclassman, I thought it was the most boring drive, passing nothing but crop fields and the occasional small town with a single gas station and a population of less than 1,000 people. However, after taking a number of ecology, plant, and wildlife courses by my junior year, I began to develop a different opinion about the western portion of the drive. 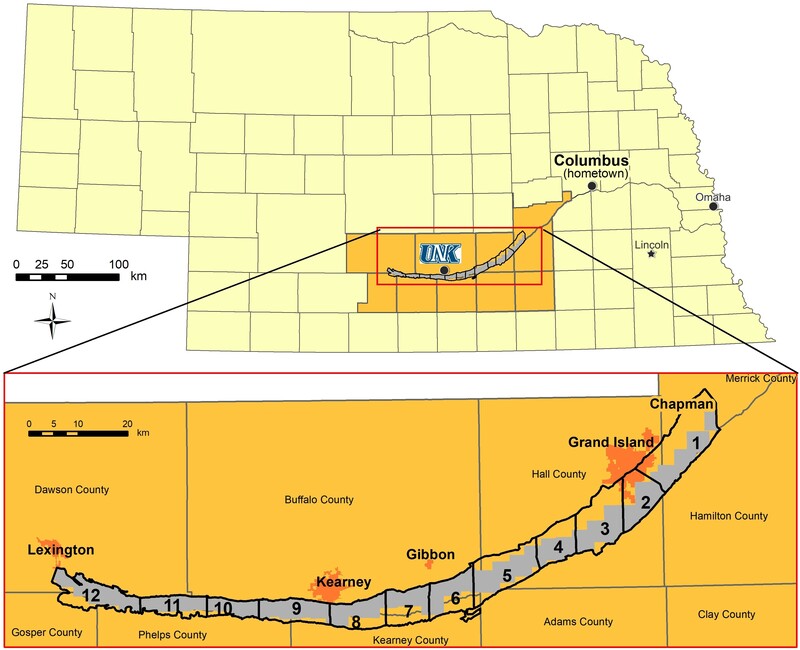 The University of Nebraska at Kearney (UNK) and the author’s hometown of Columbus, NE, in relation to the study area spanning the Central Platte River Valley. The close-up map shows the area of aerial imagery (grey) and river bridge segments (black outline) that were studied in south-central Nebraska. As I gained a better sense of the biotic communities around me, I started to notice new features on the landscape. Patches of reflected light would catch my eye as sunlight bounced off the surface of water bodies that flanked the side of the interstate. I began to pay attention to these borrow pit ponds and lakes, and they varied in size, shape, and distance to the interstate. Originally dug for extraction of sand and gravel by private companies, these pits have filled in from the high water table near the Platte River. What I once thought of as negligible ponds, I came to recognize as important human modifications to the natural prairie and riverine habitat of the region. These pits became the focus of my undergraduate research project at UNK. My journey on this project, a spatial analysis of borrow pits in the Central Platte River Valley (CPRV), began during the spring of 2016 after my undergraduate advisor in wildlife biology presented me with the idea of combining my knowledge of Geographic Information Systems (GIS) with a natural resource-based research topic. GIS is a framework and computer-based tool to gather, organize, and analyze different types of spatial data and other information. The project would involve examining borrow pit ponds and lakes in the Central Platte River Valley and include researchers from three different departments across campus—biology, communication, and geography. At the time, I had no idea exactly what I was getting myself into with a multidisciplinary research project such as this. Little did I know that this project would have a significant impact on my future research, educational, and professional goals. 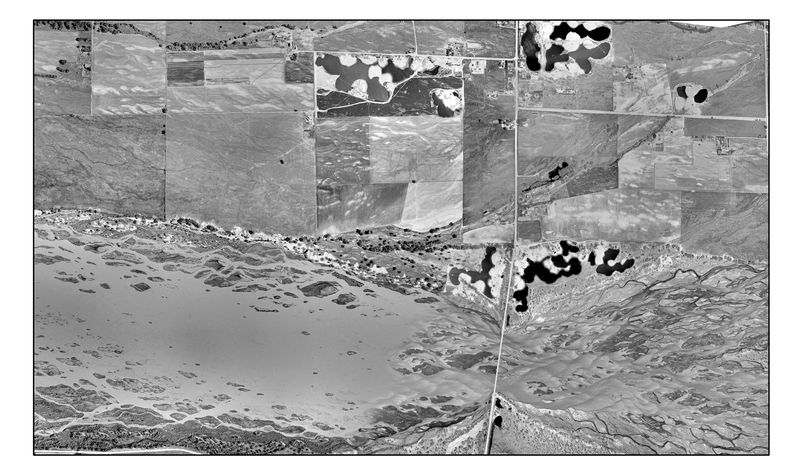 By the next fall, we started the project in full force with the goal of using GIS and historical aerial imagery to determine the abundance, size, and distribution of borrow pits along the Platte River in south-central Nebraska in 1957 and 2016. This nearly 60-year timeframe represented a period of development in central Nebraska; major roads, such as Interstate 80, were built, and cities like Grand Island and Kearney saw significant growth. Sand and gravel were mined, and continue to be mined, along the river to acquire materials to meet the demand for construction. 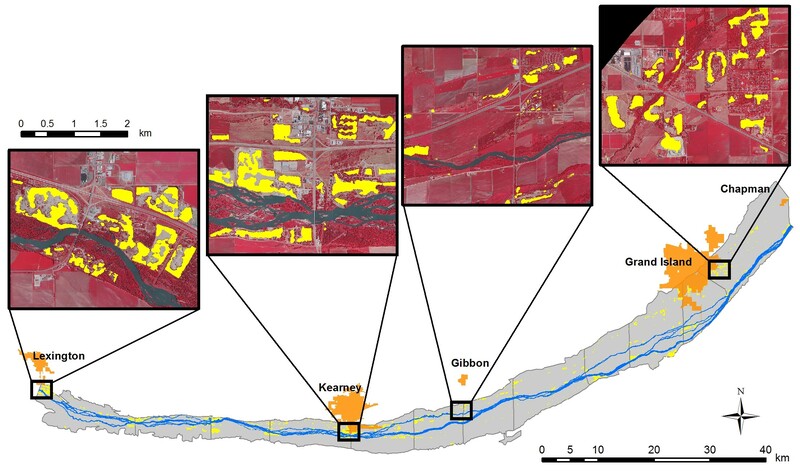 We sought to understand how creation of borrow pits for mining had contributed to changes to the landscape around the Platte River, as well as to explore potential effects of these pits on the ecology of an important part of the Platte River. The first steps to completing the project involved obtaining high resolution imagery of the study area, the Platte River floodplain in the CPRV, defined as an approximately 90-mile section of river from Lexington to Chapman, NE. 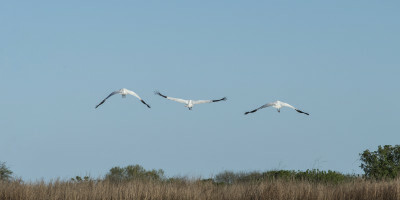 The CPRV supports expansive agriculture and is important for a diversity of plants and animals, providing habitat for several endangered and threatened species, including the Whooping Crane, Interior Least Tern, and Piping Plover, and serving as stopover sites for other migratory birds. Conservation managers and biologists use bridges that span the river to designate “bridge segments” that are referenced as boundaries in research studies and plans for land management. 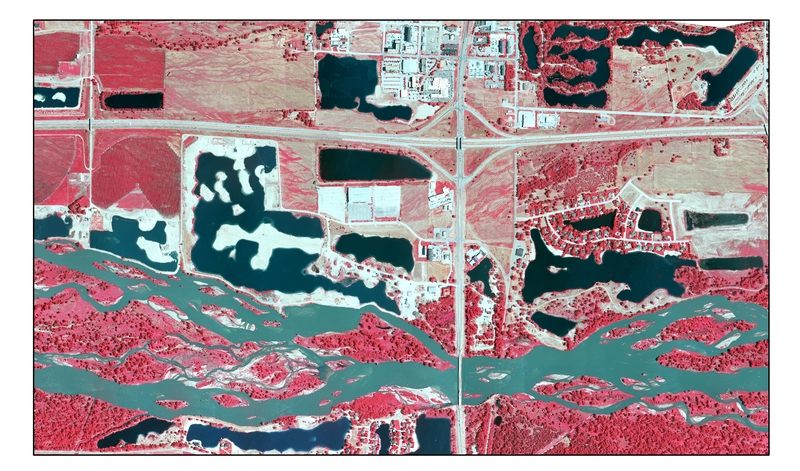 We obtained imagery for the CPRV from the Platte River Recovery Implementation Program and Rainwater Basin Joint Venture. The next steps proved very repetitive and tedious. I spent hundreds of hours combing through both sets of imagery and using a computer mouse in a GIS software program known as ArcMap to manually trace the boundaries of borrow pits that ranged from small farm ponds to large gravel operations. When driving or walking through the CPRV, it is hard to imagine the sheer number of pits or the magnitude of area that has been converted from natural prairie and riparian habitat to open-water ponds and lakes. It was advantageous to use GIS to locate and digitize these pits because it provided an accurate and efficient method to quantify the number of borrow pits and the surface area they occupy. GIS also allowed examination of the study area at multiple scales, from individual pits to the entire extent of the study area, to gain a better understanding of patterns in size and distribution of these water bodies. After spending hours scanning the imagery at a fine scale, and then looking at the images and study area as a whole, I started to appreciate the beauty of the braided channels of the Platte River and the stark contrast of the vegetation from the dark pits. Studying these distinct features changed how I viewed the landscape around me as I drove through the CPRV. It also allowed me to become aware of the beauty of some seemingly simplistic, often mundane, elements of nature. After all of the digitizing was completed, we had to calculate and report statistics about the area, perimeter, and complexity. The ability of GIS software to link a geographic location with other information allowed me to simplify this process immensely and complete work in a matter of hours that, without this technology, would have taken months or years. The number, area, and perimeter of individual pits, along with image year and bridge segment totals, were calculated relatively easily, and I made comparisons between the two years. Results showed that the total number, area, and shoreline of pits increased drastically between 1957 and 2016. We also examined the percent increases of pit area and number by bridge segment, locating areas of greatest increase within the CPRV. These results only begin to scratch the surface of the many unanswered research questions regarding these human created and modified landscape features. Future research questions could include: What are the effects of borrow pits on native biological communities? How do these pits affect birds in the CPRV during their spring migration? What is the water loss associated with evaporation from these pits? How have development and recreational opportunities arisen throughout the study area due to the dredging of the pits? Aerial images of the same location of the Platte River south of Kearney, NE, from 1957 (left) and 2016 (right), displayed at a scale of 1:24,000. 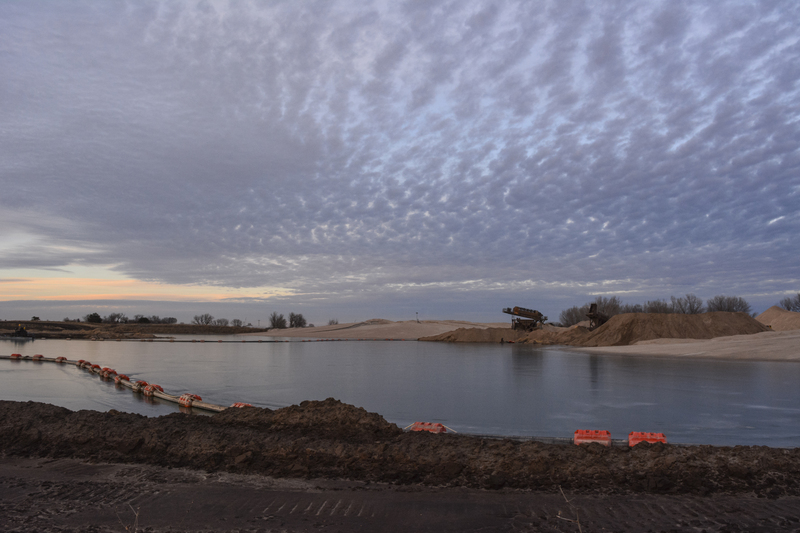 Scroll bar allows side-by-side comparison of changes to the river landscape, such as an increase in borrow pits and narrowing of the river channel between years. Base images courtesy of the US Department of Interior (1957) and Platte River Recovery Implementation Program (2016). When we completed the main components of the project, it seemed only natural to turn this undergraduate project into an academic article for a research journal. However, this proved to be one of the most challenging parts of the interdisciplinary project. Each field has its own journals, slightly different styles of writing, and expectations.  It was vital for all of the researchers, including Dr. Mary Harner, Dr. Paul Burger, Dr. Keith Geluso, Emma Brinley Buckley, and myself to work as a cohesive unit with clear, specified goals for the publication. 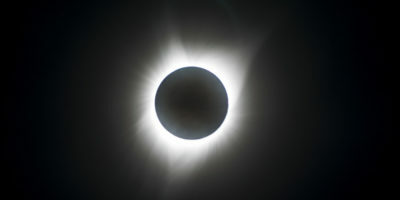 Working with other scientists from UNK and Platte Basin Timelapse, who emphasize the importance of communication in science and are experienced publishers, was very beneficial during this process. After I graduated from UNK and moved away from Kearney, we navigated difficulties that arose regarding the writing through frequent meetings, emails, and phone calls. During this time, I also had the opportunity to create figures for the paper and explore different ways to communicate the results of my project in an effective way. It was a nice change of pace to play around with color, design, and layout, and show some creativity while displaying important information regarding our results. Borrow pits (yellow) and river channels (blue) in the floodplain of the Central Platte River Valley, Nebraska. Close-up maps are at a scale of 1:80,000 and show variety in size and complexity of pits, from more rectangular pits to large, complex coiling shapes at four different locations near Interstate-80 and the Platte River. Figure from Pauley et al. 2018, Transactions of the Nebraska Academy of Sciences. As this project reaches its completion, I have come to realize that the main outcome of this research is not merely a scientific paper. The impact this project has had on my educational and professional goals is beyond the reach of a publication. The time and energy spent working on this project for the past two years have been a huge part of my scholarly life and continue to have implications for my future. I learned how to work with high resolution aerial imagery, use different GIS software, conduct geospatial analyses, and write a manuscript. But all of those skills are minimal in comparison to the lessons I learned about the importance of communication within the process of scientific research, working as part of a multi-disciplinary team, the connections between science and art, and myself as a student, researcher, and future employer. 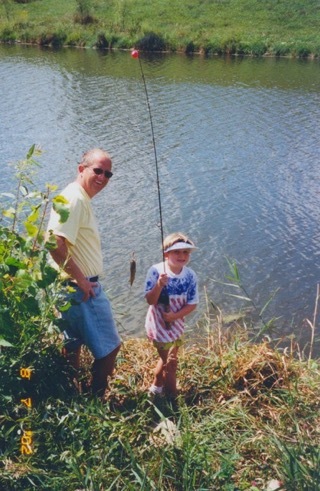 Nicole, age 7, and her father fishing near their hometown of Columbus, NE. Through this project, I gained the confidence to apply for and attend graduate school in geography to build my education in GIS and remote sensing. My eyes are open to the many possibilities of future careers using these spatial technologies for applications in natural resource and wildlife management. And most importantly, I have made an indescribable connection with this part of the state and these valuable river valley landscapes. After working with the imagery at such an intimate level, I started to see the individual pixels not just for their hue values, but for their deeper meaning and what they represent in the real world. Each individual pixel helps tell part of the landscape’s history and story. They form pieces of prairie that were seen by settlers during westward expansion, river sections where Sandhill cranes roost during their spring migration every year, fishing holes where friends gather, and ultimately part of the land that so many people call home. Understanding the history of the landscape, and people’s connections to it, has enhanced my research experience and given me a new perspective on the many levels it takes to become a successful scientist.